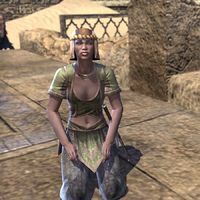 Afzoon is a Redguard pilgrim found praying at the grave of Master Ahtar in Leki's Blade. When approached, she says, "I still feel the presence of Master Ahtar in this place. Some have even seen him, if rumor is to be believed. A passing shadow only, or faint whispers. I hope it is true. Perhaps I will see him someday." This page was last modified on 29 May 2018, at 01:58.